Houston Rockets small forward Trevor Ariza may have suffered defeat in the Western Conference finals this year, but he was the true winner this weekend for the successful launch of his 1st Ariza Elevated Game Awards. Ariza kicked off his Community Weekend in style, with an action-packed celebrity basketball game on Saturday. Celebrities such as Terrell Owens, Layzie Bone, Casper Smart, and Robert Riley laced up their shoes and participated in the charity game in front of a sold out crowd at Cleveland High School. Ariza created the star studded celebrity game in hopes that it will raise awareness for his new youth-based non-profit organization, Ariza Elevated Game Awards, or AEGA. This is a community that Ariza holds very dear to his heart. 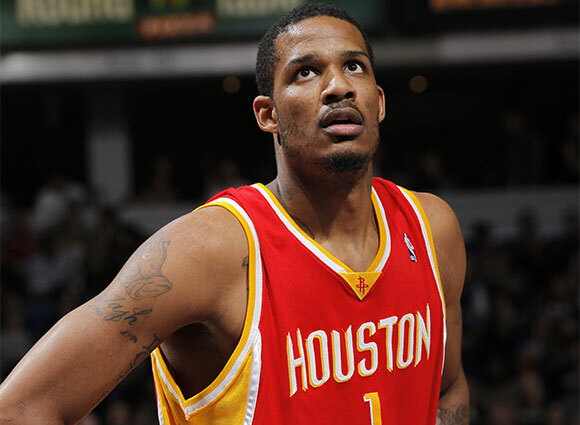 Ariza graduated from Westchester High School in Los Angeles, prior to shining on UCLA’s basketball team. Although he’s been playing professional basketball for the last 11 years, he has never forgot where he’s come from. Ariza is committed to further developing his community, which is why he started AEGA. The very true essence of the AEGA, as described on their website, is about inspiring and motivating the youth that you cannot give up. You must continue fighting. You have to keep going, keep studying, keep training hard because one day it will all pay off. Ariza was quick to show gratitude for all those that came out to support him. One of those supporters, ex-NFL star Terrell Owens, was ecstatic to come out and offer his support. “We’re here for a great cause, Team Ariza. I’m here to support his involvement with the community and its all about giving back,” Owens stated. Overall it was a successful weekend, and most importantly, it was an inspiring weekend for all those that participated.